Holds your square format and Instagram prints, as well as old 3.5 x 3.5" family photos. A single page accommodates twelve 3.5 x 3.5" prints, six on each side, and is made from clear, archival quality, high-clarity 8 mil polypropylene. Safefor long-term storage, the pages are P.A.T tested and approved. 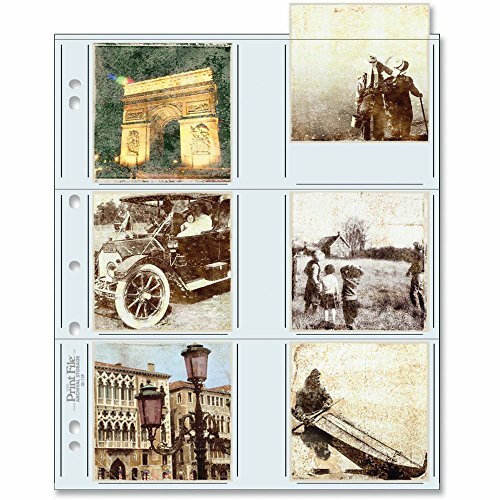 Fits Square Format & Instagram Prints Holds Old 3.5 x 3.5" Family Photos For 12 Prints, 6 on Each Side Clear Archival Quality, No PVC Safe for Long-Term Storage High-Clarity 8 mil Polypropylene P.A.T. Tested & Approved Fits SLB-1 file hangers, ALB-S, ARC-S, oversized binders, OB-1, Box Binder, and Safe-T-Binder.